Tag line: "Incredible! Inconceivable! World wrecked as monster hunts human mates!" 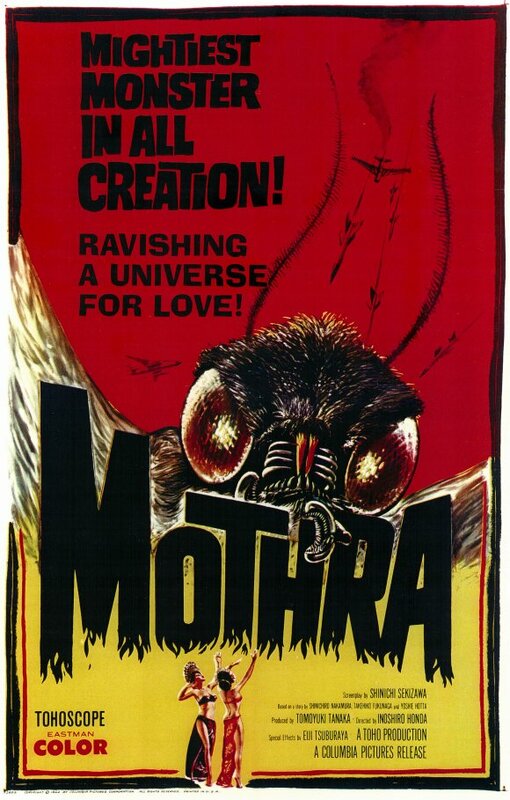 1961's Mothra differed from many of the giant monster films released by Japan's Toho Studios in that it's title creature wasn't hell-bent on destruction for destruction's sake. Unlike Godzilla, who terrorizes and destroys because he's big and nobody can stop him, Mothra is a monster on a mission, and would have gladly left the good citizens of Tokyo alone if they, in turn, left his island in peace. After learning that a highly radioactive isle may be inhabited, the government sends a team of scientists to investigate. What they find will astonish them. After becoming tangled in a carnivorous tree, Dr. Sinichi Chujo (Hiroshi Koizumi) spots a tiny set of twins (Yumi & Emi Ito), whom the island's natives believe to be fairies. Both Dr. Chujo and a reporter named Senichiro Fukuda (Frankie Sakai), who stowed away on the ship so he could see first-hand what's going on, befriend the fairies, but rich gangster Clark Nelson (Jerry Ito), who funded the expedition, kidnaps the twins so that he can put them on display in Tokyo. All attempts made by Dr. Chujo and Fukuda to free the fairies end in disaster, but the twins themselves aren't worried because they know Mothra, the protector of their island, will soon come to save them. A giant larval moth, Mothra methodically makes its way towards Tokyo, sending the entire population into a panic. Will Nelson relinquish control of the fairies, or will Tokyo be devastated by the angry monster slowly swimming towards its shore? 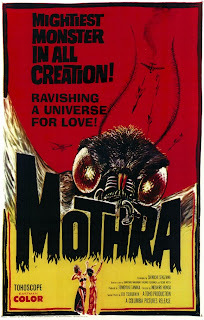 There's a lot of imagination on display in Mothra, not all of which centers around the title creature. When the scientists first arrive on the island, they're greeted by some unusual sights. There's a cave filled with brilliantly colored objects, and strange plants that seem to reach out and grab them. The twins, which stand about a foot tall, are another interesting find, and the natives who worship these two tiny beauties stage an elaborate dance to awaken Mothra, so that he might return them safely to the island. Mothra's rampage through Tokyo is impressive, and the model work here (highlighted by the destruction of a huge dam) is among the best Toho has ever produced. But this time out, the film doesn't rely on its giant monster to generate all the fun, creating instead an entire world of wonder, one that grabs your attention well before Mothra is even hatched from his egg. Geared towards a younger audience, Mothra is definitely on the lighter side of Toho's giant monster movies, and while it may lack the rougher edge of films featuring the likes of Godzilla and Rodan, the spectacle on display in Mothra more than makes up for it. I love the twins in this movie! Been a while since I saw it, I might have to pull it out of moth(ra) balls! Yeah, the twins were a nice addition to the Toho cast of characters...they really help to set Mothra apart. Thanks for stopping by and commenting, and well done on the podcast!